Just before our vacation, I was called for shearing day at the Sweet family's Valley View Ranch. It takes a lot of hands to complete all the work needed to complete the annual clip. 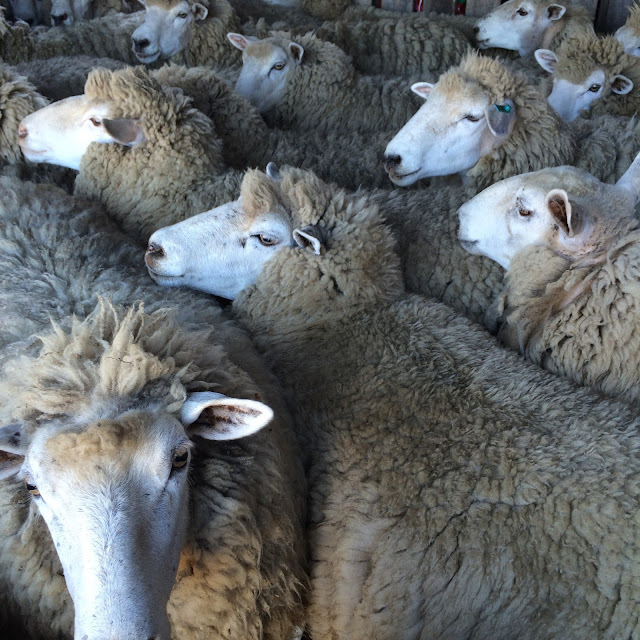 The sheep are sorted and gathered before the crew and shearers show up. Ewes gathered and ready to be sheared. Brian shearing one of the 120 he sheared that day. Brian, from Ireland, arrived without his shearing partner, who had had a livestock emergency and had to return home. Once he got started, we had plenty of people to keep up with the skirting, which is the cleaning off of the really funky and gross wool on the edges of the fleece: poop, brambles, insects, seeds, leg hair, and sometimes, even pieces of barbed wire. Shearing day this year was hot and dry, but it's fun work, full of a lot of teasing and camaraderie, as we wade through piles and piles of wool. After skirting, the fleeces are bundled up in a baler that stuffs them into a bag for transportation to the wool pools, where they will be sorted and sold. 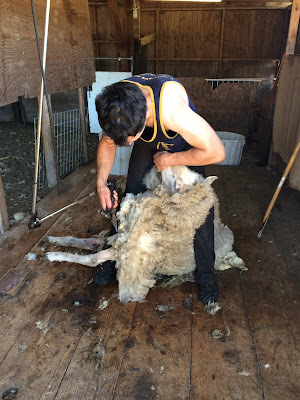 Brian single-handedly sheared 120 sheep that first day. Hats off to Brian! Before the fleeces go to the market pile, if, as I'm skirting I find one I like the feel of, I pull it aside. 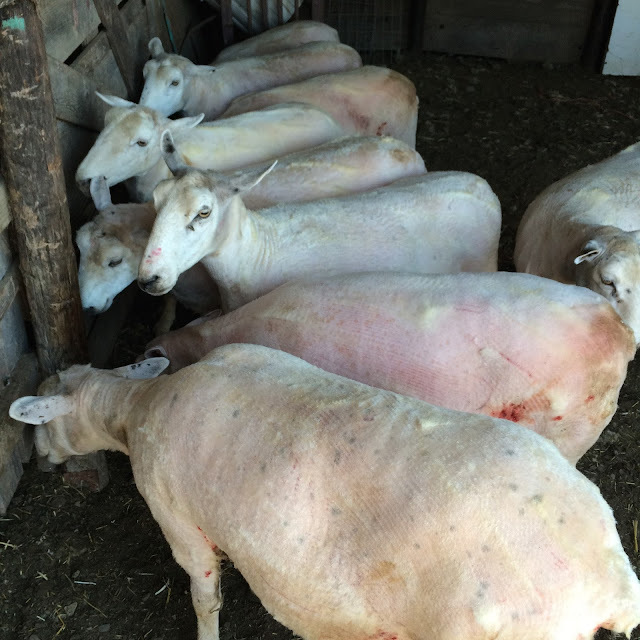 I select fleeces that appear in good condition that also feel soft. It's a very qualitative process. Some of them feel coarse and dry, while some feel buttery and light, and these are the fleeces I want to turn into yarn. Next week, I'll begin working on the more detailed skirting, to prepare for sending the fiber to the mill. Skirting fleeces in the shade. and are so happy to be done and, I think, relieved to be free of their winter coats.